Cavolo nero, or ‘Italian kale’, was originally grown in Italy and comes into season during the autumn and winter months. 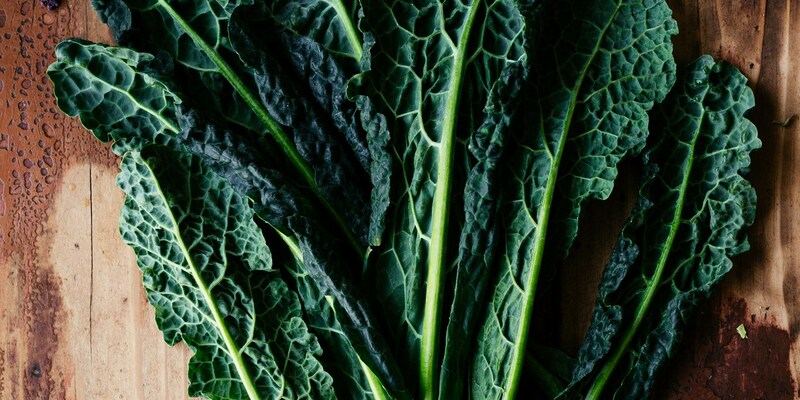 Cavolo nero is rich in nutrients, with high levels of iron and vitamins A-C. It’s dark green leaves and attractive crinkled appearance has made it a popular option for chefs looking for a more enticing alternative to better-known cabbage varieties. The distinct wrinkles on the leaves are caused by the drop in temperatures during their growing season, which helps to sweeten the final taste. Look for long, slender dark green leaves, with a thin white vein running down the centre. Avoid leaves with tears and blemishes. Cavolo nero is in season in the UK between June and March, most of which is grown in Lincolnshire. It is also available from it's native Italy during this time. Cavolo nero is incredibly versatile - you can chiffonade the dark veiny leaves before blanching, pan-frying, steaming, or cooking quickly in a stir-fry. A member of the kale family, it has similar properties to regular kale but a lighter, sweeter flavour, so enjoy raw as a health-boosting ingredient in salads. Quick, simple preparations are the best to make the most of the delicate, earthy flavour, so don't be tempted to overcook it. Cavolo nero is most commonly associated with Italian food and it pairs particularly well with autumnal Italian flavours. Theo Randall serves it as part of a rustic dinner of Spatchcock pigeon with pancetta and porcini, while Laurie Gear serves Saddle of venison with shallots and salt baked celeriac. A fun preparation is to make 'crispy seaweed' with cavolo nero, by chiffonading and deep-frying as an alternative to spring greens. You can also use cavolo nero to make kale crisps as a tasty healthy snack.